Dempo Sports Club start their campaign in I-League 2nd Division with a 1-0 win against PIFA Sports Colaba FC. Milagres Gonsales scored the only goal of the match. 5-Times National League Champions, who are playing in 2nd Division League after being relegated from I-Legaue last season, started the match as favorites. The home side had the lion share of possession and kept pressing in the opposition's half. Dempo SC came close to opening their account in the 25th minute via Vellito Cruz's free kick but found the cross bar. Dempo SC were awarded a penalty kick in the 42nd minute when PIFA Goal Keeper, Karun Kumar brought down Steven Dias. 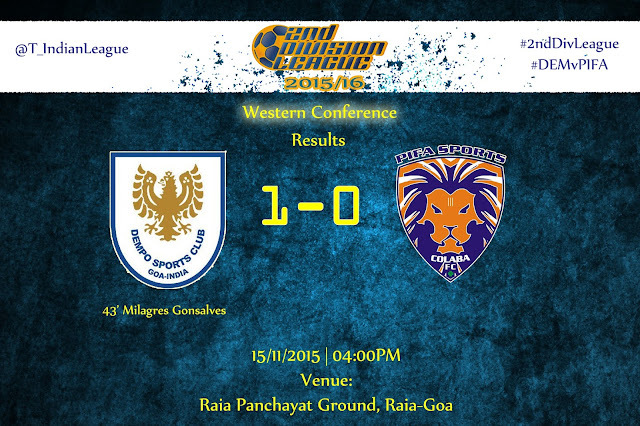 Milagres Gonsalves took the spot kick and made no error in slotting the ball into the nets. 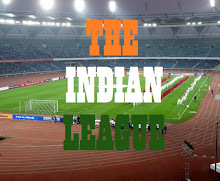 The match went into half time with Dempo leading by 1 goal. PIFA Gaffer tried to turn the tide in the 2nd Half by making a couple of changes. Scott D'Souza was brought in place of Aavesh Shaikh in the 62nd minute and Mohammad Junaid was replaced by Faique Ansari, but to no avail, with Dempo SC holding onto the solitary goal lead. Dempo SC next host Lonestar Kashmir FC on November 21st whereas PIFA Sports Colaba FC travel home where they host another Mumbai based team Kenkre FC on November 29th.